While we have scores of people moaning about the mess that Mumbai is in, we have a few others who put their proverbial ‘best foot forward’ and take those necessary steps on the road to changing the situation. One such group of change-makers is the ALM leaders from Bandra. Their relentless solution seeking attitude is indeed inspiring. 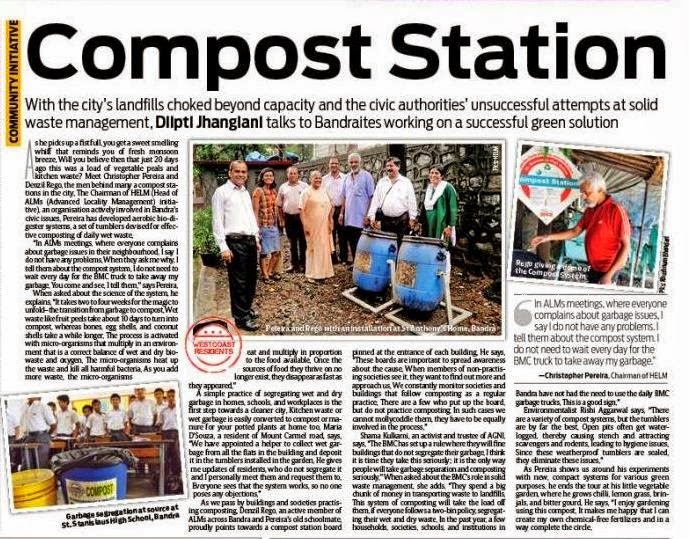 Just this morning one of the newspapers carried an elaborate article on how they have been tackling the garbage issue in their locality, especially the composting of the wet waste that they have begun. Here are a few excerpts from that news item, quotes from some of the ALM leaders who are spearheading the project. It’s a good sign indeed and hopefully other localities will soon follow their example!